Sandbag Fitness: Lifting Sandbags for Manliness (and Womanliness)! Lifting Sandbags for Manliness (and Womanliness)! Recently I've been going through some of the articles stored in my 'Writing' folder on the computer and I found something I'd written for Art Of Manliness (www.artofmanliness.com) a year or so ago. They didn't want it (perhaps it was too manly for them) so I'm giving it to you guys instead! The article is a little gimmicky (after all, isn't manliness subjective?) but I think you guys will enjoy it. For me, I don't like to really categorise anyone as being manly or womanly but I know that being fit and healthy makes me a nicer person and, or so I like to think, a better human being all round. So here goes! The last time I really stepped foot in a commercial gym facility was in 2009 - it was some awful place called ‘Celebrity Fitness’ (or something like that) and it was the kind of venue that you just wouldn’t ever see any celebrities in (except maybe D-listers and below). I was training hard and they told me off for lifting too much weight. Seriously. I was flabbergasted. To make things worse I was told by someone who would have looked more at home in a toothpaste commercial - he was basically white teeth and a ridiculous ‘fashion haircut’, all dressed up in a tracksuit. I left the place feeling like a lion whose hunt has just been put on hold by an antelope who was complaining that the run was making him sweat and it was ruining his fur. It made me think just how far the commercial gym market had slipped. They had become horrible, overly sterile environments where the key focus was to wear the best clothes, strut around the place and generally act a little metro-sexual. Wasn’t that the reason to go to nightclubs? At that point I pretty much decided that I was done with the commercial gym. At the time I was short on funds - I had just funded a 9 month adventure around the globe. I needed to get fit and, as my exercise of choice is weight training, I needed to find some inexpensive ‘weight’ to lift. As it turns out, sand is about as inexpensive as you can get. And, in many instances, you can also get it for free. So I headed down to the hardware store and purchased 250 lbs of sand for about $10. I started off with a simple set up - a big canvas bag stuffed full of smaller sandbags. I’d follow similar workouts to those that I always had done - the only real difference being that I was lifting sand instead of traditional barbells or dumbbells. At first it wasn’t easy. Handling a sandbag is considerably harder than I expected but I persevered and started making improvements. After a few workouts I realised that it was seriously hard work and not just some poor excuse for a real workout. I started to wonder how many other people were out there in a similar position to me - unable or unwilling to get to the gymnasium, or just simply time/financially poor individuals. A little more research and I found out that people had been training with sandbags for quite a long time. I started this blog, Sandbag Fitness, to share my experiences with others. I just write about the workouts that I’ve done in my garage and people seem to enjoy following them - we now get a few thousand hits per month so there’s obviously plenty of people out there who are tired of the traditional gym environment. How Will Lifting Sandbags Help With Manliness (or womanliness)? You’re lifting something real - not some modern machine designed to optimize your exercise experience. That big bag of sand could just as easily be an elk you’ve just killed or a loved one that you’re rescuing from a burning building. It’s this reason that lots of athletes are now using sandbags as part of their training. You can follow your sandbag training program anywhere. I use mine in the garage but you could just as easily train with yours: in a field/up a mountain/on a beach. The sandbag is built for manly use. You can throw it, slam it and even start punching it in a fit of rage - it will generally stand up to the abuse. Try doing that with anything at your average gym and they’ll probably ask you to leave, and maybe even call the cops. Sandbag training is tough and is used by the military, strongmen/women and elite athletes the world over to develop great strength and conditioning. It gets results quickly and with the minimum of investment - meaning that you can focus on the other important things in life. You don’t need to turn into that guy who is at the gym for 2-3 hours per day. Just because you’ve traded your traditional dumbbells and barbell for a bag of sand it doesn’t mean that you should ignore the basics. Your training should focus on big, full body compound lifts like Deadlifts, Squats, Presses and Pulls. I also like to throw plenty of bodyweight conditioning in there for good measure. The intensity of your program will generally yield better results than the volume. Focus your efforts on working hard with a sandbag weight that challenges you. Hold a sandbag at chest height in the crook of your arms (as pictured). Keeping your head and chest high, squat down until your hips are lower than your knees. Be sure to keep your spine and core braced and keep your feet flat. The Sandbag Zercher Squat will build powerful legs and a strong core. 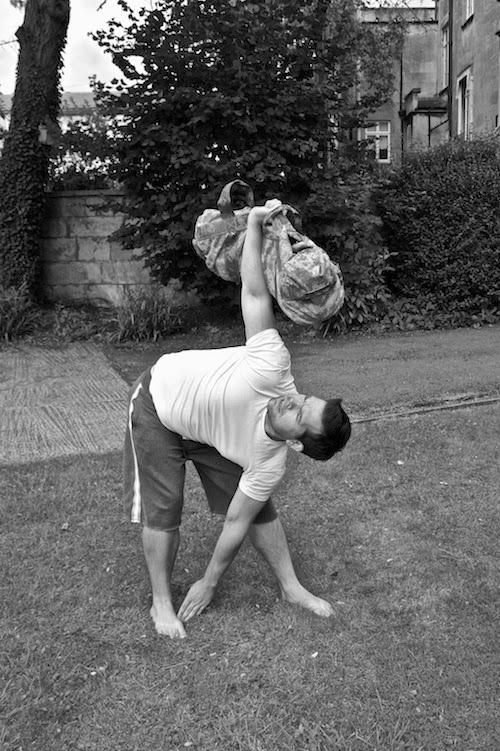 Hold a sandbag overhead in one hand - either hold a handle or the fabric of the bag. Keeping the arm straight, push your hip out to the side to initiate the movement. Slowly reach down towards the ground and touch your opposite foot. 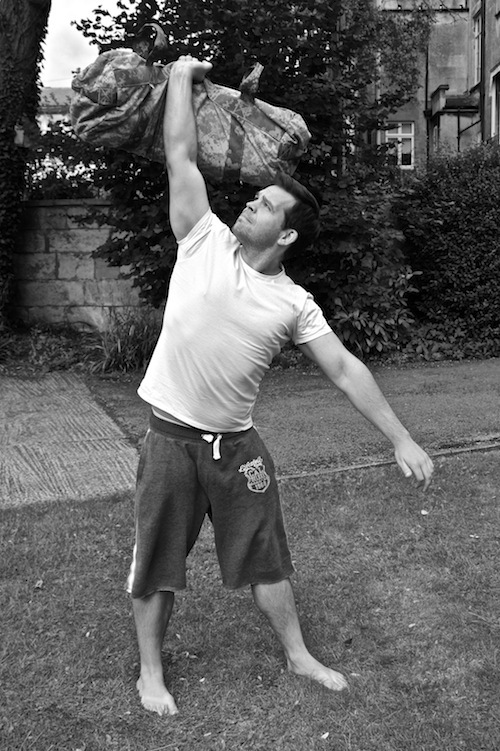 The Sandbag Windmill is a great exercise for core strength and shoulder stability. The Sandbag Clean and Press is a very tough exercise that will challenge everyone due to the difficulties in handling the constantly-shifting load. Start with the sandbag in front of you on the ground. Take a firm grip of the sandbag and lift it up to chest height in one powerful movement. Then, without leaning back too excessively, press the sandbag over your head. Arms should go to full extension. Shouting something manly at this point is optional but recommended. Drop the bag back onto the ground and repeat. Repeat for a total of 5 rounds. 3. With a sandbag over your shoulders, complete a hill run. At the top complete 10 Sandbag Back Squats. Repeat for up to 10 ‘hills’.